Some of the web versions of the Preservation Briefs differ somewhat from the printed versions. Many illustrations are new and in color; Captions are simplified and some complex charts are omitted. To order hard copies of the Briefs, see Printed Publications. The Joy Building from "Early Illustrations and Views of American Architecture" by Edmund V. Gillon, Jr. Photo: Courtesy, Dover Publications, Inc. The storefront is the most important architectural feature of many historic commercial buildings. It also plays a crucial role in a store's advertising and merchandising strategy to draw customers and increase business. Not surprisingly, then, the storefront has become the feature most commonly altered in a historic commercial building. In the process, these alterations may have completely changed or destroyed a building's distinguishing architectural features that make up its historic character. As more and more people come to recognize and appreciate the architectural heritage of America's downtowns, however, a growing interest can be seen in preserving the historic character of commercial buildings. The sensitive rehabilitation of storefronts can result not only in increased business for the owner but can also provide evidence that downtown revitalization efforts are succeeding. if the original storefront has survived largely intact but is in a deteriorated condition, what repairs should be undertaken? if the storefront has been modernized at a later date, should the later alterations be kept or the building restored to its original appearance or an entirely new design chosen? if the building's original retail use is to be changed to office or residential, can the commercial appearance of the building be retained while accommodating the new use? This Preservation Brief is intended to assist owners, architects, and planning officials in answering such questions about how to evaluate and preserve the character of historic storefronts. In so doing, it not only addresses the basic design issues associated with storefront rehabilitation, but recommends preservation treatments as well. Finally, although the Brief focuses on storefront rehabilitation, it is important to review this specific work in the broader context of preserving and maintaining the overall structure. Money spent on storefront rehabilitation may be completely wasted if repair and maintenance problems on the rest of the building are neglected. This cast iron storefront from the late 19th century has been well maintained over the years. Photo: NPS files. 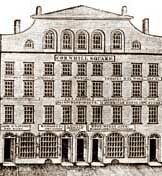 Commercial establishments of the 18th and early 19th centuries were frequently located on the ground floor of buildings and, with their residentially scaled windows and doors, were often indistinguishable from surrounding houses. In some cases, however, large bay or oriel windows comprised of small panes of glass set the shops apart from their neighbors. Awnings of wood and canvas and signs over the sidewalk were other design features seen on some early commercial buildings. The ground floors of large commercial establishments, especially in the first decades of the 19th century, were distinguished by regularly spaced, heavy piers of stone or brick, infilled with paneled doors or small paned window sash. Entrances were an integral component of the facade, typically not given any particular prominence although sometimes wider than other openings. The ready availability of architectural cast iron after the 1840s helped transform storefront design as architects and builders began to experiment using iron columns and lintels at the ground floor level. Simultaneous advances in the glass industry permitted manufacturing of large panes of glass at a reasonable cost. The combination of these two technical achievements led to the storefront as we know it today—large expanses of glass framed by thin structural elements. The advertisement of the merchant and his products in the building facade and display windows quickly became critical factors in the competitive commercial atmosphere of downtowns. In the grouping of these wide-windowed facades along major commercial streets, the image of America's cities and towns radically changed. The first cast iron fronts were simple post-and-lintel construction with little decoration. As iron craftsmen became more adept and as more ornate architectural styles became popular, cast iron fronts were given Italianate, Venetian Gothic, and French Second Empire details. Cast iron storefronts could be selected directly from catalogs, which began to appear in the early 1850s. Standardized sills, columns, and lintels could be arranged to create fronts of all sizes, styles and configurations. 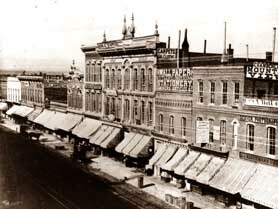 In the 1870s sheet metal storefronts became popular; they were also sold in standardized sizes and configurations through manufacturers' catalogs. 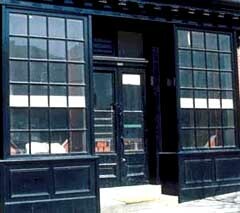 The typical 19th century storefront consisted of single or double doors flanked by display windows. The entrance was frequently recessed, not only to protect the customer from inclement weather but to increase the amount of space in which to display merchandise. In some cases an additional side door provided access to the upper floors. Thin structural members of cast iron or wood, rather than masonry piers, usually framed the storefront. The windows themselves were raised off the ground by wood, cast iron or pressed metal panels or bulkheads; frequently, a transom or series of transoms (consisting of single or multiple panes of glass) were placed above each window and door. The signboard above the storefront (the fascia covering the structural beam) became a prominent part of the building. Canvas awnings, or in some cases tin or wooden canopies, often shaded storefronts of the late 19th century. Iron fronts were frequently put onto existing buildings as a way of giving them an up-to-date appearance. Except for expanding the display window area to the maximum extent possible and the increasing use of canvas awnings, few major technical innovations in storefront design can be detected from the 1850s through 1900. The first decades of the 20th century saw the growing use of decorative transom lights (often using small prismatic glass panes) above display windows; in some cases, these transoms could be opened to permit air circulation into the store. Electric incandescent lights enabled storeowners to call attention to their entrance and display windows and permitted nighttime shopping. In the 1920's and 1930s a variety of new materials were introduced into the storefront, including aluminum and stainless steel framing elements, pigmented structural glass (in a wide variety of colors), tinted and mirrored glass, glass block and neon. This 1930s Moderne storefront has gained significance over time and should be preserved. Photo: NPS files. A bewildering number of proprietary products also appeared during this period, many of which went into storefronts including Aklo, Vitrolux, Vitrolite, and Extrudalite. Highly colored and heavily patterned marble was a popular material for the more expensive storefronts of this period. Many experiments were made with recessed entries, floating display islands, and curved glass. The utilization of neon lighting further transformed store signs into elaborate flashing and blinking creations. During this period design elements were simplified and streamlined; transom and signboard were often combined. Signs utilized typefaces for the period, including such stylized lettering as "Broadway," "Fino" and "Monogram." Larger buildings of this period, such as department stores, sometimes had fixed metal canopies, with lighting and signs as an integral component of the fascia. Because commercial architecture responds to a variety of factors—environmental, cultural, and economic—distinct regional variations in storefronts can be noted. Fixed metal canopies supported by guy wires, for example, were common in late 19th and early 20th century storefronts in southern states where it was advantageous to have shaded entrances all year long. Such a detail was less common in the northeast where moveable canvas awnings predominated. These awnings could be lowered in summer to keep buildings cooler and raised in winter when sunlight helps to heat the building. Become familiar with the style of your building and the role of the storefront in the overall design. Don't "early up" a front. Avoid stock "lumberyard colonial" detailing such as coach lanterns, mansard overhangings, wood shakes, nonoperable shutters and small paned windows except where they existed historically. Preserve the storefront's character even though there is a new use on the interior If less exposed window area is desirable, consider the use of interior blinds and insulating curtains rather than altering the existing historic fabric. Avoid use of materials that were unavailable when the storefront was constructed; this includes vinyl and aluminum siding, anodized aluminum, mirrored or tinted glass, artificial stone, and brick veneer. Choose paint colors based on the buildings historical appearance. In general do not coat surfaces that have never been painted. For 19th century storefronts, contrasting colors may be appropriate, but avoid too many different colors on a single facade. The important key to a successful rehabilitation of a historic commercial building is planning and selecting treatments that are sensitive to the architectural character of the storefront. Storefronts of the 1940s, 50s, and 60s were frequently installed by attaching studs or a metal grid over an early front and applying new covering materals. Photo: Bob Dunn. As a first step, it is therefore essential to identify and evaluate the existing storefront's construction materials; architectural features; and the relationship of those features to the upper stories. This evaluation will permit a better understanding of the storefront's role in, and significance to, the overall design of the building. A second and equally important step in planning the rehabilitation work is a careful examination of the storefront's physical conditions to determine the extent and nature of rehabilitation work needed. In most cases, this examination is best undertaken by a qualified professional. Storefront's Construction Materials: What are the construction materials? Wood? Metal? Brick or other masonry? A combination? Storefront's Architectural Features: What are the various architectural features comprising the storefront and how are they arranged in relationship to each other? What do the columns or piers supporting the storefront look like? Are they heavy or light in appearance? Are they flush with the windows or do they protrude? Are they all structural elements or are some columns decorative? By evaluating the components of a storefront as well as their existing condition, a successful rehabilitation is more likely. Photo: HABS collection, NPS. Are the display windows and transoms single panes of glass or are they subdivided? Are they flush with the facade or are they recessed? What is the proportion of area between the display windows and transom? Are there window openings in the base panels to allow natural light into the basement? Are the entrances centered? Are they recessed? Is one entrance more prominent than the others? How is the primary retail entrance differentiated from other entrances? Is there evidence that new entrances have been added or have some been relocated? Are the doors original or are they later replacements? Are there any surviving decorative elements such as molded cornices, column capitals, fascia boards, brackets, signs, awnings or canopies? Is there a beltcourse, cornice, or fascia board between the first and second floor? Are some elements older than others indicating changes over time? Storefront's Relationship to Upper Stories: Is there a difference in materials between the storefront and upper stories? Were the storefront and floors above it created as an overall design or were they very different and unrelated to each other? It is also worthwhile to study the neighboring commercial buildings and their distinctive characteristics to look for similarities (canopies, lighting, signs) as well as differences. This can help determine whether the storefront in question is significant and unique in its own right and/or whether it is significant as part of an overall commercial streetscape. Do the surface materials need repair? Is paint flaking? Are metal components rusting? Do joints need recaulking where materials meet glass windows? Mild deterioration generally requires only maintenance level treatments. Can rotted or rusted or broken sections of material be replaced with new material to match the old? Can solid material (such as Carrara glass) from a non-conspicuous location be used on the historic facade to repair damaged elements? Do stone or brick components need repointing? Is the storefront watertight with good flashing connections? Are there leaky gutters or air conditioner units which drip condensation on the storefront? Is caulking needed? Moderate deterioration generally requires patching or splicing of the existing elements with new pieces to match the deteriorated element. Have existing facing materials deteriorated beyond repair through vandalism, settlement, or water penetration? Is there a loss of structural integrity? Is the material rusted through, rotted, buckling, completely missing? Are structural lintels sagging? Are support columns settled or out of alignment? Severe deterioration generally requires replacement of deteriorated elements as part of the overall rehabilitation. In evaluating whether the existing storefront is worthy of preservation, recognize that good design can exist in any period; a storefront added in 1930 may have greater architectural merit than what is replaced. 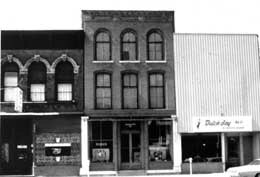 In commercial historic districts, it is often the diversity of styles and detailing that contribute to the character; removing a storefront dating from 1910 simply because other buildings in the district have been restored to their 1860s appearance may not be the best preservation approach. If the storefront design is a good example of its period and if it has gained significance over time, it should be retained as part of the historical evolution of the building (this architectural distinctiveness could also be an economic asset as it may attract attention to the building). The evaluation of the storefront's architectural features and physical condition will help determine the best course of action in the actual rehabilitation work. The following recommendations, adapted from the Secretary of the Interior's "Standards for Rehabilitation" and the accompanying interpretive guidelines, are designed to ensure that the historic commercial character of the building is retained in the rehabilitation process. If the original or significant storefront exists, repair and retain the historic features using recommended treatments (see following sections on rehabilitating metal, wood and masonry storefronts as well as the guidelines for rehabilitating existing historic storefronts). If the original or significant storefront no longer exists or is too deteriorated to save, undertake a contemporary design which is compatible with the rest of the building in scale, design, materials, color and texture; or undertake an accurate restoration based on historical research and physical evidence (see section on "Replacement Storefronts"). Where an original or significant storefront no longer exists and no evidence exists to document its early appearance, it is generally preferable to undertake a contemporary design that retains the commercial "flavor" of the building. The new storefront design should not draw attention away from the historic building with its detailing but rather should respect the existing historic character of the overall building. A new design that copies traditional details or features from neighboring buildings or other structures of the period may give the building a historical appearance which blends in with its neighbors but which never, in fact, existed. For this reason, use of conjectural designs, even if based on similar buildings elsewhere in the neighborhood or the availability of different architectural elements from other buildings or structures, is generally not recommended. This finely detailed bronze storefront is typical of many constructed during the 1920s. The original grilles, spandrel panel and windows are all intact. Photo: NPS files. Rehabilitating metal storefronts can be a complex and time-consuming task. Before steps are taken to analyze or treat deteriorated storefronts, it is necessary to know which metal is involved, because each has unique properties and distinct preservation treatments. 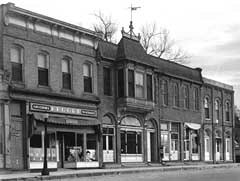 Storefronts were fabricated using a variety of metals, including cast iron, bronze, copper, tin, galvanized sheet iron, cast zinc, and stainless steel. Determining metallic composition can be a difficult process especially if components are encrusted with paint. Original architect's specifications (sometimes available from permit offices, town halls, or records of the original owner) can be important clues in this regard and should be checked if at all possible. Iron—a magnetic, gray-white malleable metal, readily susceptible to oxidation. Cast iron, most commonly found in storefronts, is shaped by molds and can withstand great compressive loads. Rolled sheet iron, sometimes galvanized with zinc, also was used in store-front construction. Stainless steel began to appear in storefronts after 1930. Zinc—a medium-hard, bluish-white metal, widely used as a protective coating for iron and steel. It is softer than iron and is nonmagnetic. Copper—a nonmagnetic, corrosion-resistant, malleable metal, initially reddish-brown but when exposed to the atmosphere turns brown to black to green. Bronze and brass—nonmagnetic, abrasive-resistant alloys combining copper with varying amounts of zinc, lead, or tin. These copper alloys, more commonly found in office buildings or large department stores, range in color from lemon yellow to golden brown to green depending on their composition and are well suited for casting. Aluminum—a lightweight, nonmagnetic metal commonly found on storefronts dating from the 1920s and 30s. Its brightness and resistance to corrosion has made it a popular storefront material in the 20th century. Simply because single components of a storefront need repair or replacement should not be justification for replacing an entire storefront. Deteriorated metal architectural elements can be repaired by a variety of means, although the nature of the repair will depend on the extent of the deterioration, the type of metal and its location, and the overall cost of such repairs. Patches can be used to mend, cover or fill a deteriorated area. Such patches should be a close match to the original material to prevent galvanic corrosion. Splicing—replacement of a small section with new material—should be undertaken on structural members only when temporary bracing has been constructed to carry the load. Reinforcing—or bracing the damaged element with additional new metal material—can relieve fatigue or overloading in some situations. If metal components have deteriorated to a point where they have actually failed (or are missing), replacement is the only reasonable course of action. If the components are significant to the overall design of the storefront, they should be carefully removed and substituted with components that match the original in material, size and detailing. Before going to the expense of reproducing the original, it may be useful to check salvage yards for compatible components. Missing parts of cast iron storefronts can be replaced by new cast iron members that are reproductions of the original. New wooden patterns, however, usually need to be made if the members are large. This procedure tends to be expensive (it is usually impossible to use existing iron components as patterns to cast large elements because cast iron shrinks 1/5 inch per foot as it cools). In some situations, less expensive substitute materials such as aluminum, wood, plastics, and fiberglass, painted to match the metal, can be used without compromising the architectural character of the resource. Cast iron storefronts are usually encrusted with layers of paint which need to be removed to restore crispness to the details. Where paint buildup and rust are not severe problems, handscraping and wire-brushing are viable cleaning methods. While it is necessary to remove all rust before repainting, it is not necessary to remove all paint. For situations involving extensive paint buildup and corrosion, mechanical methods such as low-pressure gentle dry grit blasting (80-100 psi) can be effective and economical, providing a good surface for paint. Masonry and wood surfaces adjacent to the cleaning area, however, should be protected to avoid inadvertent damage from the blasting. It will be necessary to recaulk and putty the heads of screws and bolts after grit blasting to prevent moisture from entering the joints. Cleaned areas should be painted immediately after cleaning with a rust-inhibiting primer to prevent new corrosion. Before any cleaning is undertaken, local codes should be checked to ensure compliance with environmental safety requirements. Storefronts utilizing softer metals (lead, tin), sheet metals (sheet copper), and plated metals (tin and terneplate) should not be cleaned mechanically (grit blasting) because their plating or finish can be easily abraded and damaged. It is usually preferable to clean these softer metals with a chemical (acid pickling or phosphate dipping) method. Once the surface of the metal has been cleaned of all corrosion, grease, and dirt, a rustinhibiting primer coat should be applied. Finish coats especially formulated for metals, consisting of lacquers, varnishes, enamels or special coatings, can be applied once the primer has dried. Primer and finish coats should be selected for chemical compatibility with the particular metal in question. Bronze storefronts, common to large commercial office buildings and major department stores of the 20th century, can be cleaned by a variety of methods; since all cleaning removes some surface metal and patina, it should be undertaken only with good reason (such as the need to remove encrusted salts, bird droppings or dirt). Excessive cleaning can remove the texture and finish of the metal. Since this patina can protect the bronze from further corrosion, it should be retained if possible. If it is desirable to remove the patina to restore the original surface of the bronze, several cleaning methods can be used: chemical compounds including rottenstone and oil, whiting and ammonia, or precipitated chalk and ammonia, can be rubbed onto bronze surfaces with a soft, clean cloth with little or no damage. A number of commercial cleaning companies successfully use a combination of 5% oxalic acid solution together with finely ground India pumice powder. Fine glass-bead blasting (or peening) and crushed walnut shell blasting also can be acceptable mechanical methods if carried out in controlled circumstances under low (80-100 psi) pressure. Care should be taken to protect any adjacent wood or masonry from the blasting. The proper cleaning of metal storefronts should not be considered a "do-it-yourself" project. The nature and condition of the material should be assessed by a competent professional, and the work accomplished by a company specializing in such work. he key to the successful rehabilitation of wooden storefronts is a careful evaluation of existing physical conditions. Moisture, vandalism, insect attack, and lack of maintenance can all contribute to the deterioration of wooden storefronts. 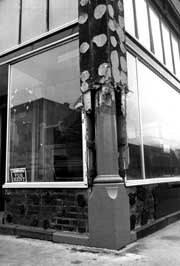 Rather than replace an entire wooden storefront, a new wooden component can be pieced-in, as seen in this column base. Photo: NPS files. Paint failure should not be mistakenly interpreted as a sign that the wood is in poor condition and therefore irreparable. Wood is frequently in sound physical condition beneath unsightly paint. An ice pick or awl may be used to test wood for soundness—decayed wood that is jabbed will lift up in short irregular pieces; sound wood will separate in long fibrous splinters. Storefronts showing signs of physical deterioration can often be repaired using simple methods. Partially decayed wood can be patched, built up, chemically treated or consolidated and then painted to achieve a sound condition, good appearance, and greatly extended life. To repair wood showing signs of rot, it is advisable to dry the wood; carefully apply a fungicide such as pentachlorophenol (a highly toxic substance) to all decayed areas; then treat with 2 or 3 applications of boiled linseed oil (24 hours between applications). Afterward, fill cracks and holes with putty; caulk the joints between the various wooden members; and finally prime and paint the surface. Partially decayed wood may also be strengthened and stabilized by consolidation, using semirigid epoxies which saturate porous decayed wood and then harden. The consolidated wood can then be filled with a semirigid epoxy patching compound, sanded and painted. More information on epoxies can be found in the publication "Epoxies for Wood Repairs in Historic Buildings," cited in the bibliography. Where components of wood storefronts are so badly deteriorated that they cannot be stabilized, it is possible to replace the deteriorated parts with new pieces. These techniques all require skill and some expense, but are recommended in cases where decorative elements, such as brackets or pilasters, are involved. In some cases, missing edges can be filled and rebuilt using wood putty or epoxy compounds. When the epoxy cures, it can be sanded smooth and painted to achieve a durable and waterproof repair. Wooden storefronts were historically painted to deter the harmful effects of weathering (moisture, ultraviolet rays from the sun, wind, etc.) as well as to define and accent architectural features. Repainting exterior woodwork is thus an inexpensive way to provide continued protection from weathering and to give a fresh appearance to the storefront. Before repainting, however, a careful inspection of all painted wood surfaces needs to be conducted in order to determine the extent of surface preparation necessary, that is, whether the existing layers of paint have deteriorated to the point that they will need to be partially or totally removed prior to applying the new paint. 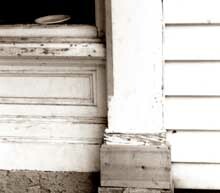 As a general rule, removing paint from historic exterior woodwork should be avoided unless absolutely essential. Once conditions warranting removal have been identified, however, paint can be removed to the next sound layer using the gentlest method possible, then the woodwork repainted. For example, such conditions as mildewing, excessive chalking, or staining (from the oxidization of rusting nails or metal anchorage devices) generally require only thorough surface cleaning prior to repainting. Intercoat peeling, solvent blistering, and wrinkling require removal of the affected layer using mild abrasive methods such as hand scraping and sanding. In all of these cases of limited paint deterioration, after proper surface preparation the exterior woodwork may be given one or more coats of a high quality exterior oil finish paint. There are several acceptable methods for total paint removal, depending on the particular wooden element involved. They include such thermal devices as an electric heat plate with scraper for flat surfaces such as siding, window sills, and doors or an electric hot-air gun with profiled scraper for solid decorative elements such as gingerbread or molding. Chemical methods play a more limited, supplemental role in removing paint from historic exterior woodwork; for example, caustic or solvent-base strippers may be used to remove paint from window muntins because thermal devices can easily break the glass. Detachable wooden elements such as exterior shutters, balusters and columns, can probably best be stripped by means of immersion in commercial dip tanks because other methods are too laborious. Care must be taken in rinsing all chemical residue off the wood prior to painting or the new paint will not adhere. Finally, if the exterior woodwork has been stripped to bare wood, priming should take place within 48 hours (unless the wood is wet, in which case it should be permitted to dry before painting). Application of a high quality oil type exterior primer will provide a surface over which either an oil or latex top coat can be successfully used. Some storefronts are constructed of brick or stone, and like their metal and wooden counterparts, also may have been subjected to physical damage or alterations over time. Although mortar may have disintegrated, inappropriate surface coatings applied, and openings reduced or blocked up, careful rehabilitation will help restore the visual and physical integrity of the masonry storefront. If obvious signs of deterioration—disintegrating mortar, spalling bricks or stone—are present, the causes (ground moisture, leaky downspouts, etc.) should be identified and corrected. Some repointing may be necessary on the masonry surface, but should be limited to areas in which so much mortar is missing that water accumulates in the mortar joints, causing further deterioration. New mortar should duplicate the composition, color, texture, and hardness, as well as the joint size and profile of the original. Badly spalling bricks may have to be replaced. Deteriorated stone may be replaced in kind, or with a matching substitute material; in some cases where not visually prominent, it may be covered with stucco, possibly scored to resemble blocks of stone. Inappropriate cleaning techniques can be a major source of damage to historic masonry buildings. Historic masonry should be cleaned only when necessary to halt deterioration or to remove graffiti and stains, and always with the gentlest means possible, such as water and a mild detergent using natural bristle brushes, and/or a non-harmful chemical solution, both followed by a low-pressure water rinse. It is important to remember that many mid-19th century brick buildings were painted immediately or soon after construction to protect poor quality brick or to imitate stone. Some historic masonry buildings not originally painted were painted at a later date to hide alterations or repairs, or to solve recurring maintenance or moisture problems. Thus, whether for reasons of historical tradition or practicality, it may be preferable to retain existing paint. If it is readily apparent that paint is not historic and is a later, perhaps unsightly or inappropriate treatment, removal may be attempted, but only if this can be carried out without damaging the historic masonry. Generally, paint removal from historic masonry may be accomplished successfully only with the use of specially formulated chemical paint removers. No abrasive techniques, such as wet or dry sandblasting should be considered. If nonhistoric paint cannot be removed without using abrasive methods, it is best to leave the masonry painted, although repainting in a compatible color may help visually. Removing unsightly mastic from masonry presents a similarly serious problem. Its removal by mechanical means may result in abrading the masonry, and chemical and heat methods may prove ineffective, although solvents like acetone will aid in softening the hardened mastic. If the mastic has become brittle, a flat chisel may be used to pop it off; but this technique, if not undertaken with care, may result in damaging the masonry. And even if total removal is possible, the mastic may have permanently stained the masonry. Replacement of these masonry sections marred by mastic application may be one option in limited situations; individual pieces of stone or bricks that have been damaged by inappropriate alterations may be cut out and replaced with new pieces that duplicate the original. However, since an exact match will be nearly impossible to achieve, it may be necessary to paint the repaired masonry in order to create a harmonious facade. Replacement of a large area with new materials may not be acceptable as it may give the building a new, nonhistoric appearance inappropriate to the building style and period. This photograph shows the impact of preserving historic storefronts. The one on the right has been totally obscured by a "modern" front added in the 1950s. Photo: NPS files. Where an architecturally or historically significant storefront no longer exists or is too deteriorated to save, a new front should be designed which is compatible with the size, scale, color, material, and character of the building. Such a design should be undertaken based on a thorough understanding of the building's architecture and, where appropriate, the surrounding streetscape. For example, just because upper floor windows are arched is not sufficient justification for designing arched openings for the new storefront. The new design should "read" as a storefront; filling in the space with brick or similar solid material is inappropriate for historic buildings. Similarly the creation of an arcade or other new design element, which alters the architectural and historic character of the building and its relationship with the street, should be avoided. The guidelines on page 8 can assist in developing replacement storefront designs that respect the historic character of the building yet meet current economic and code requirements. Scale: Respect the scale and proportion of the existing building in the new storefront design. Materials: Select construction materials that are appropriate to the storefronts; wood, cast iron, and glass are usually more appropriate replacement materials than masonry which tends to give a massive appearance. Cornice: Respect the horizontal separation between the storefront and the upper stories. A cornice or fascia board traditionally helped contain the store's sign. Frame: Maintain the historic planar relationship of the storefront to the facade of the building and the streetscape (if appropriate). Most storefront frames are generally composed of horizontal and vertical elements. Entrances: Differentiate the primary retail entrance from the secondary access to upper floors. In order to meet current code requirements, out-swinging doors generally must be recessed. Entrances should be placed where there were entrances historically, especially when echoed by architectural detailing (a pediment or projecting bay) on the upper stories. Windows: The storefront generally should be as transparent as possible. Use of glass in doors, transoms, and display areas allows for visibility into and out of the store. Secondary Design Elements: Keep the treatment of secondary design elements such as graphics and awnings as simple as possible in order to avoid visual clutter to the building and its streetscape. A restoration program requires thorough documentation of the historic development of the building prior to initiating work. If a restoration of the original storefront is contemplated, old photographs and prints, as well as physical evidence, should be used in determining the form and details of the original. Because storefronts are particularly susceptible to alteration in response to changing marketing techniques, it is worthwhile to find visual documentation from a variety of periods to have a clear understanding of the evolution of the storefront. Removal of later additions that contribute to the character of the building should not be undertaken. The rehabilitation of pigmented structural glass storefronts, common in the 1930's, is a delicate and often frustrating task, due to the fragility and scarcity of the material. Typically the glass was installed against masonry walls with asphaltic mastic and a system of metal shelf angles bolted to the walls on three-foot centers. Joints between the panels were filled with cork tape or an elastic joint cement to cushion movement and prevent moisture infiltration. Try to locate old photographs or prints to determine what alterations have been made to the storefront and when they were undertaken. Awnings were common elements of storefronts at the turn of the century. Photo: NPS files. The decision to repair or replace damaged glass panels should be made on a case-by-case basis. In some instances, the damage may be so minor or the likelihood of finding replacement glass so small, that repairing, reanchoring and/or stabilizing the damaged glass panel may be the only prudent choice. If the panel is totally destroyed or missing, it may be possible to replace with glass salvaged from a demolition; or a substitute material, such as "spandrel glass," which approximates the appearance of the original. Although pigmented structural glass is no longer readily available, occasionally long-established glass "jobbers" will have a limited supply to repair historic storefronts. Where based on historic precedent, consider the use of canvas awnings on historic storefronts. Awnings can help shelter passersby, reduce glare, and conserve energy by controlling the amount of sunlight hitting the store window, although buildings with northern exposures will seldom functionally require them. Today's canvas awnings have an average life expectancy of between 4 and 7 years. In many cases awnings can disguise, in an inexpensive manner, later inappropriate alterations and can provide both additional color and a strong store identification. Fixed aluminum awnings and awnings simulating mansard roofs and umbrellas are generally inappropriate for older commercial buildings. If awnings are added, choose those that are made from soft canvas or vinyl materials rather than wood or metal; be certain that they are installed without damaging the building or visually impairing distinctive architectural features and can be operable for maximum energy conservation effect. Signs were an important aspect of 19th and early 20th century storefronts and today play an important role in defining the character of a business district. In examining historic streetscape photographs, one is struck by the number of signs—in windows, over doors, painted on exterior walls, and hanging over (and sometimes across) the street. While this confusion was part of the character of 19th century cities and towns, today's approach toward signs in historic districts tends to be much more conservative. Removal of some signs can have a dramatic effect in improving the visual appearance of a building; these include modern backlit fluorescent signs, large applied signs with distinctive corporate logos, and those signs attached to a building in such a way as to obscure significant architectural detailing. For this reason, their removal is encouraged in the process of rehabilitation. If new signs are designed, they should be of a size and style compatible with the historic building and should not cover or obscure significant architectural detailing or features. For many 19th century buildings, it was common to mount signs on the lintel above the first story. Another common approach, especially at the turn of the century, was to paint signs directly on the inside of the display windows. Frequently this was done in gold leaf. New hanging signs may be appropriate for historic commercial buildings, if they are of a scale and design compatible with the historic buildings. Retention of signs and advertising painted on historic walls, if of historic or artistic interest (especially where they provide evidence of early or original occupants), is encouraged. Paint analysis can reveal the storefront's historic paint colors and may be worth undertaking if a careful restoration is desired. If not, the paint color should be, at a minimum, appropriate to the style and setting of the building. This also means that if the building is in a historic district, the color selection should complement the building in question as well as other buildings in the block. In general, color schemes for wall and major decorative trim or details should be kept simple; in most cases the color or colors chosen for a storefront should be used on other painted exterior detailing (windows, shutter, cornice, etc.) to unify upper and lower portions of the facade. Glass windows are generally the most prominent features in historic storefronts, and care should be taken to ensure that they are properly maintained. For smaller paned windows with wooden frames, deteriorated putty should be removed manually, taking care not to damage wood along the rabbet. To reglaze, a bead of linseed oil-based putty should be laid around the perimeter of the rabbet; the glass pane pressed into place; glazing points inserted to hold the pane; and a final seal of putty beveled around the edge of the glass. For metal framed windows, glazing compound and special glazing clips are used to secure the glass; a final seal of glazing compound then is often applied. If the glass needs replacing, the new glass should match the original in size, color and reflective qualities. Mirrored or tinted glass are generally inappropriate replacements for historic storefronts. The replacement of cracked or missing glass in large windows should be undertaken by professional glaziers. Alterations to a storefront called for by public safety, handicapped access, and fire codes can be difficult design problems in historic buildings. Negotiations can be undertaken with appropriate officials to ensure that all applicable codes are being met while maintaining the historic character of the original construction materials and features. If, for instance, doors opening inward must be changed, rather than replace them with new doors, it may be possible to reverse the hinges and stops so that they will swing outward. A key to the successful rehabilitation of historic commercial buildings is the sensitive treatment of the first floor itself. Wherever possible, significant storefronts (be they original or later alterations), including windows, sash, doors, transoms, signs and decorative features, should be repaired in order to retain the historic character of the building. Where original or early storefronts no longer exist or are too deteriorated to save, the commercial character of the building should nonetheless be preserved—either through an accurate restoration based on historic research and physical evidence or a contemporary design which is compatible with the scale, design, materials, color and texture of the historic building. The sensitive rehabilitation of historic storefronts will not only enhance the architectural character of the overall building but will contribute to rejuvenating neighborhoods or business districts as well. Special thanks go to Kay D. Weeks and Sharon C. Park, AIA, for providing technical and editorial direction in the development of this Preservation Brief. The following individuals are also to be thanked for reviewing the manuscript and making suggestions: Norman Mintz, New York, N Y.: Judith Kitchen, Columbus, Ohio: Jim Vaseff, Atlanta, Georgia,: and Tom Moriarity, Washington, D C. Finally thanks go to Technical Preservation Service Branch staff members, especially Martha A. Gutrick, Michael J. Auer and Anne E. Grimmer, whose valuable comments were incorporated into the final text and who contributed to the publication of the brief. This publication has been prepared pursuant to the National Historic Preservation Act of 1966, as amended, which directs the Secretary of the Interior to develop and make available information concerning historic properties. Technical Preservation Services (TPS), National Park Service prepares standards, guidelines, and other educational materials on responsible historic preservation treatments for a broad public. Bryan, John M. and the Triad Architectural Associates. Abbeville, South Carolina: Using Grant-in-Aid Funds for Rehabilitation Planning and Project Work in the Commercial Town Square. Washington, D.C.: Technical Preservation Services Division, U.S. Department of the Interior, 1980. Gayle, Margot and Edmund V. Gillon, Jr. Cast Iron Architecture in New York. New York: Dover Publications, Inc., 1971. Gayle, Margot and David W. Look and John G. Waite. Metals in America's Historic Buildings: Uses and Preservation Treatments. Washington, D.C.: Technical Preservation Services Division, U.S. Department of the Interior, 1980. Gelbloom, Mara. 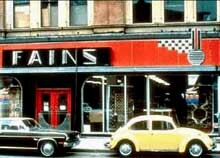 "Old Storefronts." The Old House Journal VI, No. 3 (March 1978), pp. 2534. Grimmer, Anne E. "Dangers of Abrasive Cleaning to Historic Buildings." (Preservation Briefs 6), Washington, D.C.: Technical Preservation Services Division, U.S. Department of the Interior, 1979. Guthrie, Susan. Main Street Historic District, Van Buren, Arkansas: Using Grant-in-Aid Funds for Storefront Rehabilitation. Washington, D.C.: Technical Preservation Services Division, U.S. Department of the Interior, 1980. Hartmann, Robert R. Design for the Business District, Part I. Racine, Wisconsin: Racine Urban Aesthetics, Inc., 1979. Hensley, Tom. The Preservation of Historic Pigmented Structural Glass (Vitrolite and Carrara Glass). Denver: Rocky Mountain Regional Office, National Park Service, 1981. Marsh, Ellen. "An Introduction to Storefront Rehabilitation. Conserve Neighborhoods, No. 7 (Summer 1979). Mintz, Norman. "A Practical Guide to Storefront Rehabilitation. Technical Series No. 2.: Albany, N.Y.: Preservation League of New York State, 1977. Myers, John H. "The Repair of Historic Wooden Windows." (Preservation Briefs 9). Washington, D.C.: Technical Preservation Services Division, U.S. Department of the Interior, 1980. Park, Sharon C. Storefront Rehabilitation: A 19th Century Commercial Building. Washington, D.C.: Technical Preservation Services Division, U.S. Department of the Interior, 1980. Phillips, Morgan W. and Dr. Judith E. Selwyn. Epoxies for Wood Repairs in Historic Buildings. Washington, D.C.: Technical Preservation Services Division, U.S. Department of the Interior, 1978. Rifkind, Carole. Main Street: The Face of Urban America. New York: Harper and Row, 1977. The Secretary of the Interior's Standards for Rehabilitation and Guidelines for Rehabilitating Historic Buildings. Washington, D.C.: Technical Preservation Services Division, U.S. Department of the Interior, 1980. Weeks, Kay D. and David W. Look. "Exterior Paint Problems on Historic Woodwork." (Preservation Briefs 10). Washington, D.C.: Technical Preservation Services, U.S. Department of the Interior, 1982.